You may have noticed that I haven't got a new post up on Deep Thunder since last week. Well, I've been busy. Posting there will be a little sparse until the end of this month, I only have so much time in the day and this month is turning out to be a little packed. I've been doing some artwork on commission for a couple of people. I finished the first project this morning. 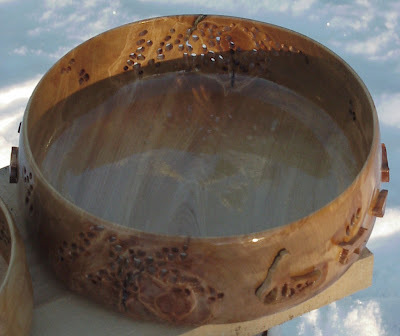 It's a pair of sculpted birch bowls. The larger one is decorated with the silhouette of an Alaskan musher and his loyal team. This is a new design for me. The filigree and grain are intended to convey the feeling of a snow storm. The glossy interior finish resembles ice on a frozen lake. Now, if you'll excuse me for a while, I've got half a dozen more to finish. Okay, now I'm all covetous and stuff. Which is unbecoming. You got guts Wright! Man I am still a simp compared to this. I want some birch!!!!!!! Does that seem envious and stuff which of course is also unbecoming. Screw it I want some BIRCH!!!!!!! Covetous and Envy where precisely the emotions I was trying invoke with this piece. Ahhh, art. Shawn, your wish is my command. I've got all the birch you can use - I'm waiting for you to come up here and get it. Hell, I'll even let you use my shop, again. Bring the FESTOOLs. Hey. Is this where you keep the embarrassing videos? I'll say this about you, Nathan, you're persistent. Well, not so good really. Some guy in Alaska isn't paying attention. I, however, either have a really thick skin or am totally clueless. Your choice. BTW, the bowls are gorgeous. BTW2, sending out "Lamb" inspired me to pick up another Christopher Moore book..."A Dirty Job" about a guy in San Francisco who has been recruited for a new position: as Death. Absolutely loving it by the 2nd page. Let me know how you like yours. Oh hey, meant to mention to you, Nathan, that I got Lamb in the mail yesterday. Thanks much. Just got to find time to read it. Funny, but today I saw it referenced online somewhere, forget now, and it got hysterically glowing reviews. I'm looking to reading it. And speaking of which, since I won it from you - and since we seem to all read each other's blogs and hang out online together - I think that when I'm done with it I will pass it on to one of the others around here (hmmm, I smell some kind of contest) with the ultimate goal of keeping it in play within our little group of online friends. What'daya think? Also have not forgotten I owe you some Niven and Pournelle, this weekend I'll dig out the boxes and find it. Promise. Hell, I might even find time to make a video...we'll see. I think keeping it in the "family" is a great idea. And truth be told, if you ever post that video, I'm gonna probably laugh at the screen for a good ten minutes before I click "play". Oh, now, I'm going to do it for sure. Me wants Lamb, Me wants Lamb! Well, I'll have to think up some kind of contest or something. I'm normally the silly, sarcastic comment leaver -- but honestly, Jim, those bowls are incredible. Really. but honestly, Jim, those bowls are incredible. Really. (he says in his best Han Solo impression - which, really, isn't very good). Now I covet the bowls, Lamb, AND Han Solo. So far I've invoked Covetous and Envious feelings - and been damned. Art - is there anything it can't do? Yeah, that one with holes in the side can't hold water. Unless you freeze it first. well, yeah, you've got me there. I would definitely advise against using my stuff to contain liquids of any kind, frozen or otherwise. Cereal is right out.